November 2014. FXB Director Dr. Jennifer Leaning served as a member of an eight-person independent (without ties to Israel or Palestine) fact-finding mission to Gaza. 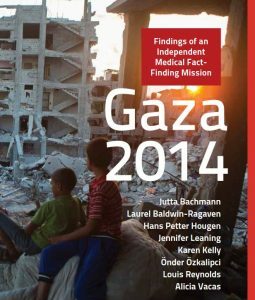 Physicians for Human Rights-Israel (PHR-Israel) commissioned the report in July 2014, during the Israel 50-day military offensive in the Gaza strip. The mission gathered evidence and drew preliminary conclusions regarding types, causes and patterns of injuries and attacks; attacks on medical teams and facilities; evacuation; impact of the conflict on the healthcare system; and longer-term issues including rehabilitation of the wounded, mental health, public health and displacement. Among several findings and recommendations in the report, the fact-finding mission concluded that the Israeli attacks were characterized by heavy and unpredictable bombardments of civilian neighborhoods that failed to discriminate between legitimate targets and protected populations causing widespread destruction of homes and civilian property. PHR-Israel hosts a summary of the report and the report itself. Abisaab, J., S. Balsari, Z. Ali Siam, et al. November 2014. Based on a Harvard FXB field investigation in Jordan in June 2014 and drawing on a prior FXB field investigation conducted in Lebanon in November 2013, presents an assessment of key problems and provides key recommendations to the policy community aimed at improving life conditions for the estimated 600,000 Syrian refugees now in Jordan. January 2014. This investigation sought to fill gaps in previous studies of India’s handmade carpet sector. Over 3,200 cases covering 9 states in northern India are investigated. The report covers “all modes of slave-like labor exploitation” in the carpet sector and documents the supply chain from production source to retail markets in the United States. February 2014. This analysis aims to alert the United Nations Office of the Special Adviser on the Prevention of Genocide and other intergovernmental bodies to the persistent patterns of violent attacks and actions against the Roma in Hungary. Argues that the resurgence of hate crimes and discrimination indicates a need for vigorous early assessment of the risk of violence and for measures to ensure the safety of Roma and other minority groups. July 2014. In a climate of complex parallel structures, post-war tensions, and historical prejudice, a Harvard FXB research team examined the barriers to Roma, Ashkali, and Egyptian access to education, employment and documentary proof of identity. The team also probed issues of national identity and values, in view of Kosovo’s struggles to integrate minority communities and become a multicultural society.